One of the coolest things we think about Bollyspice is that not only do we have writers from all over the globe we also have readers, friends and associates from all over the world! So not only do our writers get to cover special events in places like Australia, London, Germany, US and the Netherlands as well as India, we also can get cool firsthand reports from events where we may not have a writer. 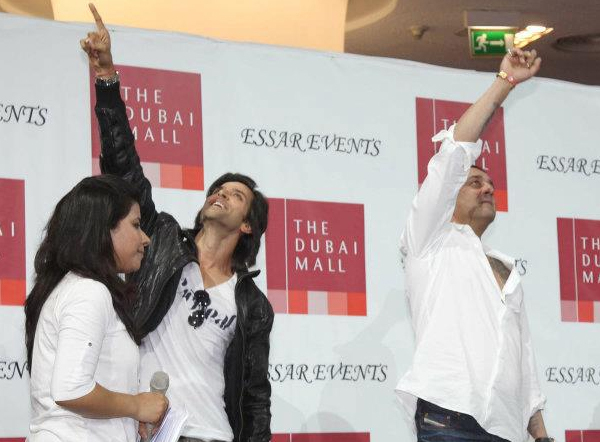 Last week Hrithik Roshan and Sanjay Dutt were in Dubai to promote Agneepath and we have a special report from Vani of Hrithikrules! Check out her firsthand experience of the madness and the coolness that happened at the Meet and Greet at Dubai Mall. The event was scheduled to start at 8:30 pm and I went to the venue an hour earlier because to be honest I wasn’t really expecting a huge crowd that soon since it was a working day. But to my surprise by the time I walked in, all the 3 floors above the venue were packed with people and the ground floor where the event was to take place too was slowly getting filled. Within 15-20 minutes of my arrival the crowds started growing and so did the noise. By 9 pm both Hrithik and Sanjay had arrived and you could hear the crowds cheering for them, I wasn’t expecting a lot of cheers for Sanjay Dutt (okay I did not think he had a huge fan base here, but I was soooooo wrong). The both acknowledged the crowd, the minute Hrithik uttered the first word there was a huge roar……the first line had a lot of girls and there was a bunch of them at the left who kept calling out his name and he turned and waved to them or something and they probably fainted hehe. Sanjay was REALLY REALLY shy…he hardly spoke at the event; a lot of times would keep looking to Hrithik for responses (I thought that was cute and Hrithik kept encouraging him to speak). About his childhood ambition and if he wanted to be an actor always and Hrithik said he wanted to be a astronaut but I think he said he was not good at science and so could not be one and therefore became an actor and he could fly because *points to the crowd* you all make me believe that I can fly. Basically thanked his fans. Both of them agreed that the film was very difficult for them physically and Sanjay said that after shooting for the climax for so many days he could not take it anymore and told Karan Malhotra that he could not beat his this boy (Hrithik) anymore. Hrithik said that it was amazing to work with Sanju Sir, he was as humble and down to earth with him as he was 10 years back. There was a bit when they were asked to say dialogues from the film and Hrithik said he could not say any dialogue but just said the word ‘Mandwa’ and Sanju says that is one of his fav ones too. Then the audience started to scream asking for Hrithik to dance and he tried to avoid it saying that he did not dance in the film, but the crowd kept insisting and so he gave in. He then asked the audience to help him out because he had no steps so he chose one kid from the audience to dance with him and Sanjay to Chikni Chameli. Sanju backed out after a step but Hrithik continued dancing and was cheered on by the audience. Personally I thought the event was poorly organized, the security was struggling to manage the crowds, they had no idea of who the actors were and could not answer the foreigners who were asking about the actors and a lot of times the Indian/Asian crowd around stepped in to respond. Sadly, there were a lot of fights going on because people wanted to move closer to the stage and the bouncers were facing a tough time at all the four entrances with everyone pushing and screaming. They wanted to try and let the families and women with kids go ahead but everyone was pushing the minute they let someone in. No posters of the film to be seen anywhere. The volume of the microphone was so low and the crowd was so loud that one really had to struggle to listen to the actors. But keeping that aside and Hrithik totally made the evening worth every bit of pain one had to go through. Sanjay Dutt was really cute but too shy and Hrithik who I’ve seen at a few events in the past and is usually the shy one took everyone by surprise by being so sporty and interactive, he was smiling throughout the evening, acknowledging fans and it was adorable to see the mutual love and respect both he and Sanjay Dutt share for each other. Add to that Hrithik looked so young and dreamy- I could hear a lot of people comment on how he looked like he was in his twenties and not someone who has just turned 38! 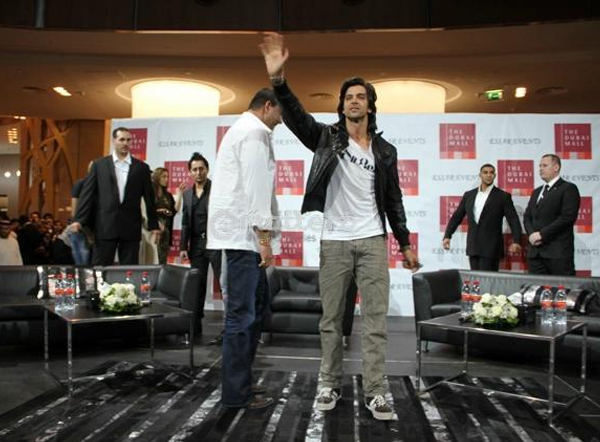 Hrithik and Sanjay are to meet fans at the Dubai Mall! It is packed there right now…anticipation is building as is the excitement- Watch this space for exclusive updates!! Its toooo hot in Dubai Mall- Double Hunk Power! A strong screaming crowd at Dubai Mall! An excited Hrithik trying to speak! He is asking his fans to support him on the 26th….but the screams are deafening! Go Hrithik!! 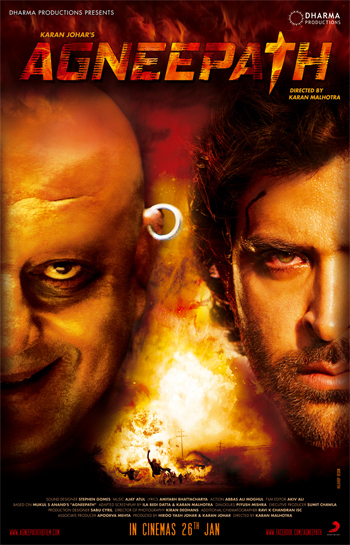 Agneepath Hrithik said that Sanjay Dutt is as down to earth and as amazing to work with, as he was 10 yrs before! 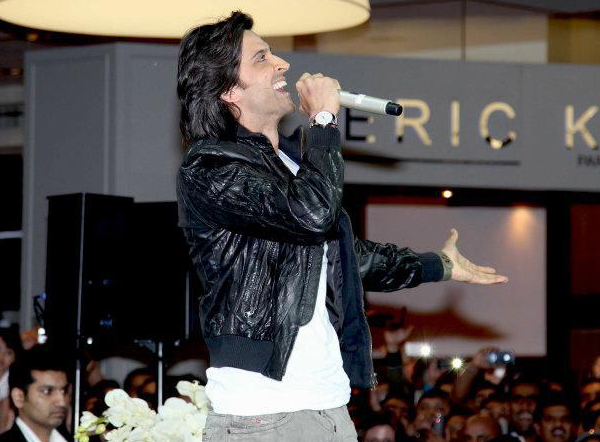 Agneepath Hrithik loves Dubai and doesn’t want to go back! PS- We all love you Duggu! 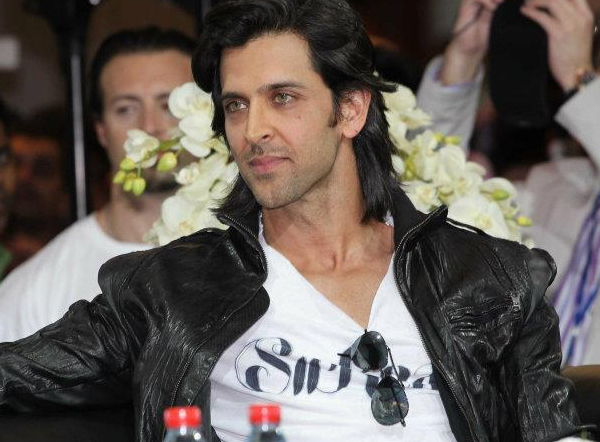 Agneepath Hrithik looking his charming and gorgeous self in white tee shirt! Very cute! Check out images and a video from the event!